Well hello there sunshine and happy Monday! How was your weekend? It was actually pretty laid back around here. In fact, I only left the house once. Seriously, have I told y’all I’m a homebody?! It’s true, and my husband teases me about my old lady status all the time. What can I say? I like being home. Plus I had a sick kiddo this weekend, so that adds to the home-ness. Anyway, I hope your weekend was fabulous and you’re ready to start a brand new week. 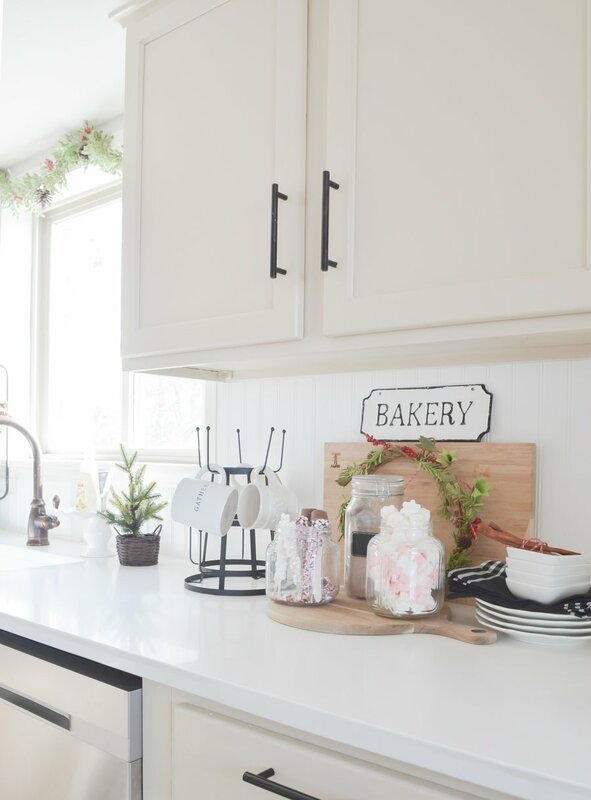 Today I want to share our simple Christmas kitchen decor, and a cute little hot chocolate bar that my kids have been obsessed with lately. They are huge hot chocolate fans and we take it pretty seriously around here. We go all out out with fancy marshmallows, chocolate stirring sticks, sprinkles, whipped cream, etc. It’s so fun, and it’s always one of my favorite things about this time of year. 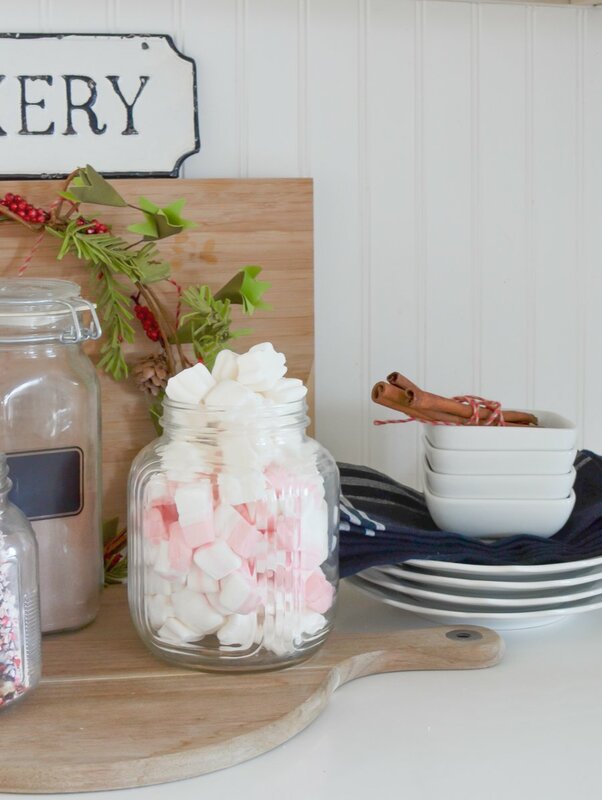 I love putting this little hot cocoa bar together for my kids every Christmas, and it’s so fun to watch how excited they get over such a simple thing. Isn’t that the best part of holidays? It’s those simple little traditions that make this time of year so sweet. And they pretty much drink hot chocolate every day, so this stash of goodies doesn’t last long! 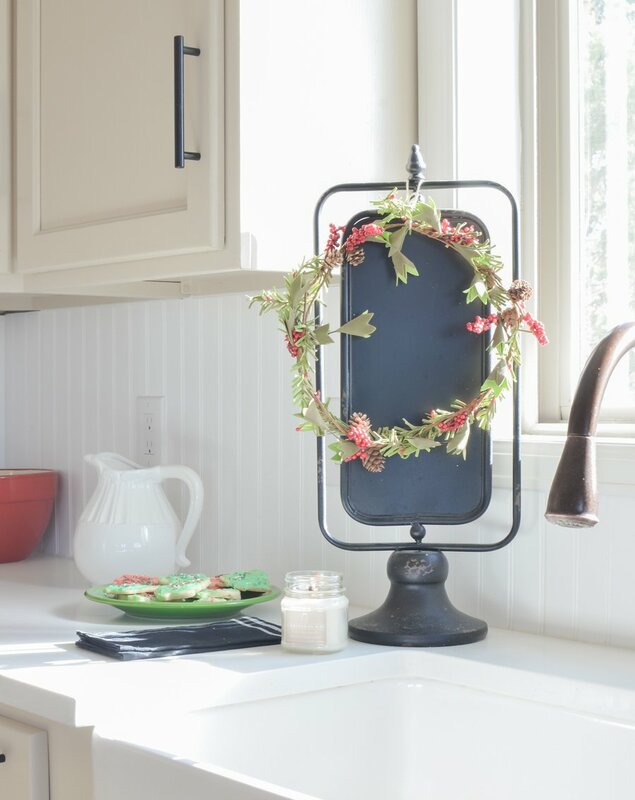 I kept this Christmas kitchen decor pretty simple in here with just a few little things–garland above the window (from Michael’s last year), a mini tree, a yummy Christmas candle, and a small DIY wreath on the chalkboard. That’s it–easy peasy. I didn’t even decorate the other half of our kitchen! This weekend, the older kids and I made our first batch of Christmas sugar cookies. I let them do all of the frosting and decorating, and it was SO fun. The kitchen was a total mess, but I loved it. And these cookies are delicious! Sometimes I hesitate to share things with you guys because I think it might be too simple or not “interesting” enough for the blog, but I always have to remind myself that simple is good. Our kitchen isn’t the biggest or the fanciest by any means, but it’s definitely the heart of our home. 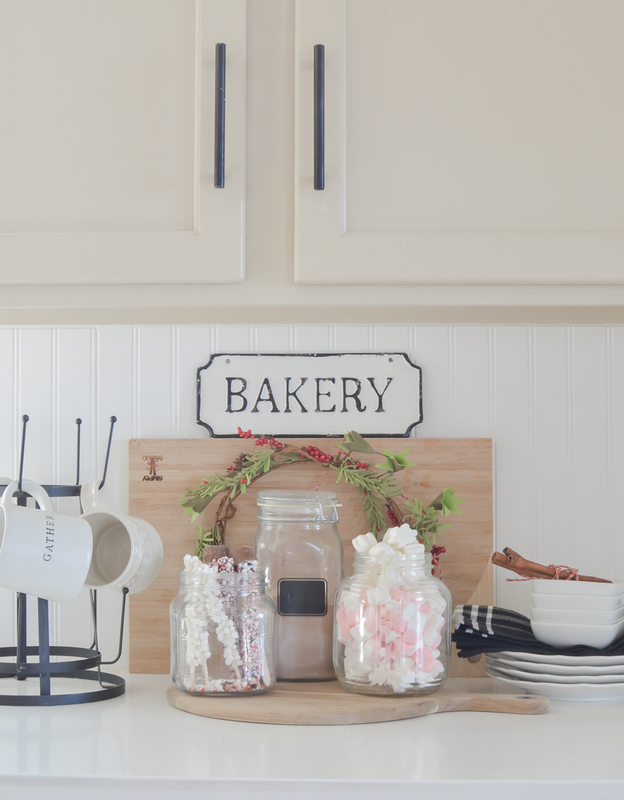 I love adding in little pops of Christmas kitchen decor to make it feel cozy for the season. That little cutie helps too! thank you Becky, always appreciate your kindness! Thank you Tracy, I really appreciate that! Simple is perfect and I love the garland and wreath!!! And you’re little one is precious 😘 The hot chocolate bar is awesome!! My kiddos would love that! 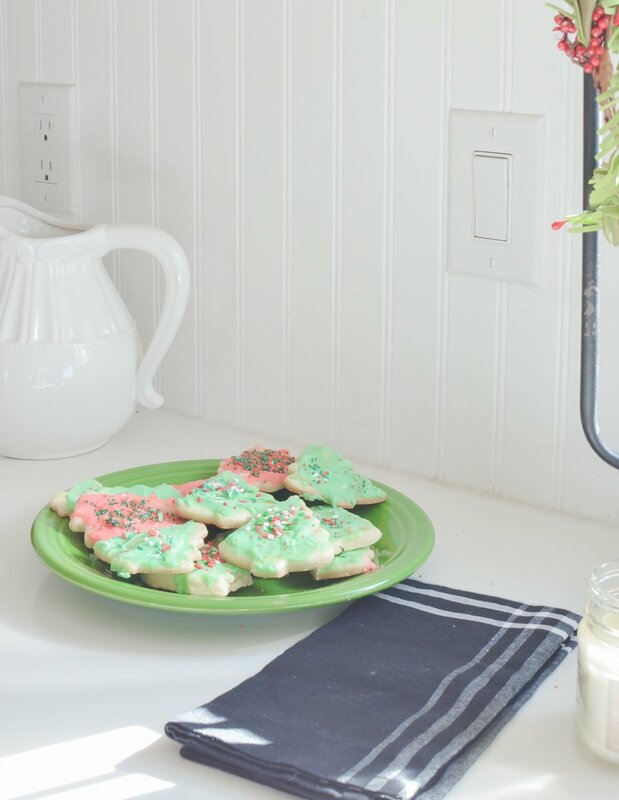 When I looked at your Christmas kitchen post I felt nostalgic for the time when my children were small and we made cookies and Christmas was all about them. So sweet that you make your kids a hot chocolate station every year. 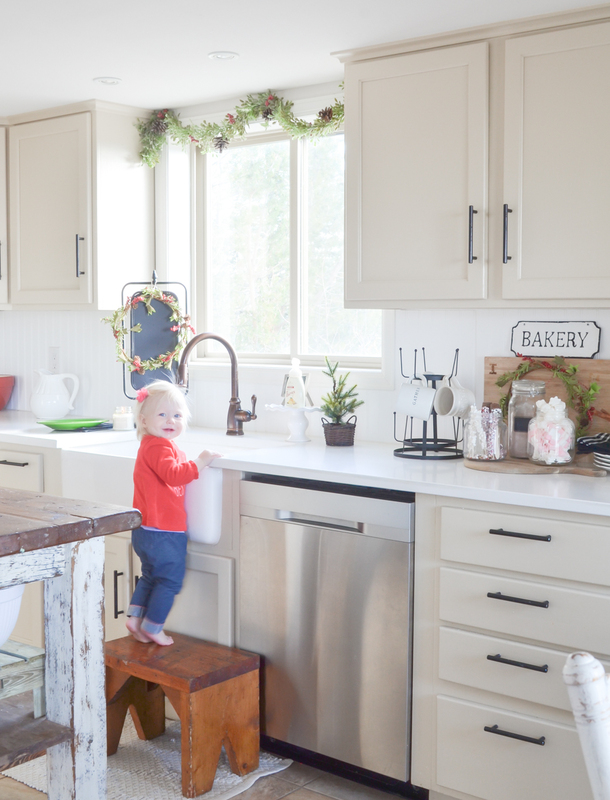 Your kitchen is anything but simple – obviously it is filled with love and by the way, the picture of your little girl is adorable. Thanks for the memories. ah your comment makes me emotional Janet, because it makes me think of one day when my little ones won’t be little anymore. And Christmas won’t be all about these simple things they enjoy so much. This season is so special, I want to soak in every minute! Love the hot cocoa bar. I will be doing that this year for sure, looks like so much fun and a way to bring your family closer with fun and love. You have the best ideas !!!!! yes definitely! Just a simple thing, but everyone enjoys it so much. Your kitchen and hot cocoa bar is perfect! And adding your little one in the picture is pure perfection! She’s adorable! As always I look forward to your posts! Enjoy your day! haha thank you Donna, I couldn’t resist slipping that cute photo in there! Simple is good! It’s easy to get lost in the perfectly decorated pictures online, the longer I look for inspiration sometimes the more frozen I get in not knowing what to do. This is perfect! Still is very functional and cute! I totally hear you Audrey and agree 100%. But I always find myself coming back to what is simple and easy! They were this color when we moved in. But the paint color is called Hush by Benjamin Moore. haha yes Gayle, they get pretty excited about it!! I think it’s just all the treats and candy that goes into making hot chocolate. But we only do it like this at Christmas time!! The beautiful simplicity you share is what draws a lot of us here. Love every bit of your home. Your littlest one is growing way to fast. Merry Christmas! ah thank you Suzanne, I really appreciate that SO much!! 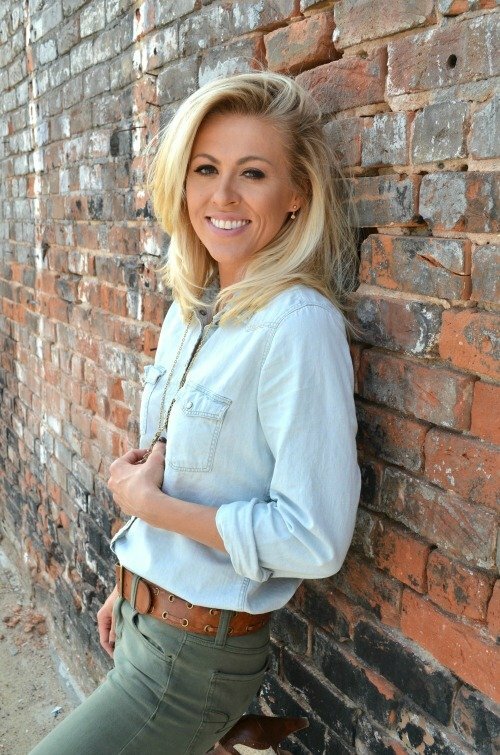 Hi Sarah, love your beautiful and simple ideas. May I ask a question? When you prepare the hot chocolate then for the kiddos, do you use a teakettle, microwave or put water thru a keurig? I use a tea kettle. The old school way 🙂 We don’t even own a microwave! Just a small toaster oven. 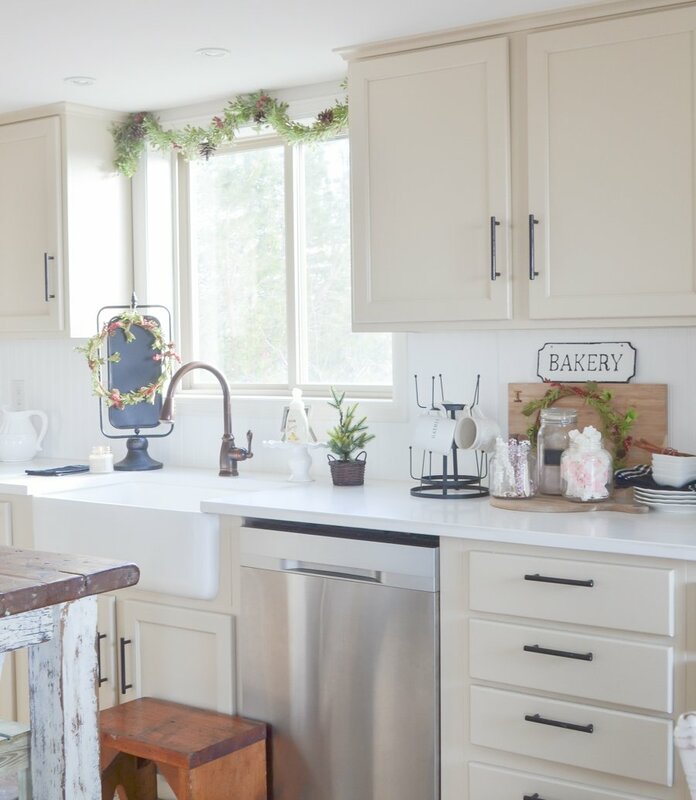 I love your simple but perfect kitchen decor…..just enough but not overdone. You are such a great mother and letting your children bake cookies with you creates memories they will always remember. I also am a homebody and my sisters are always pointing that out but I really enjoy my home and family. Ah thank you Nancy, you are so kind!! And I’m so happy to hear you’re a homebody too. Kindred spirits! I love how your hot chocolate bar makes it easily accessible! 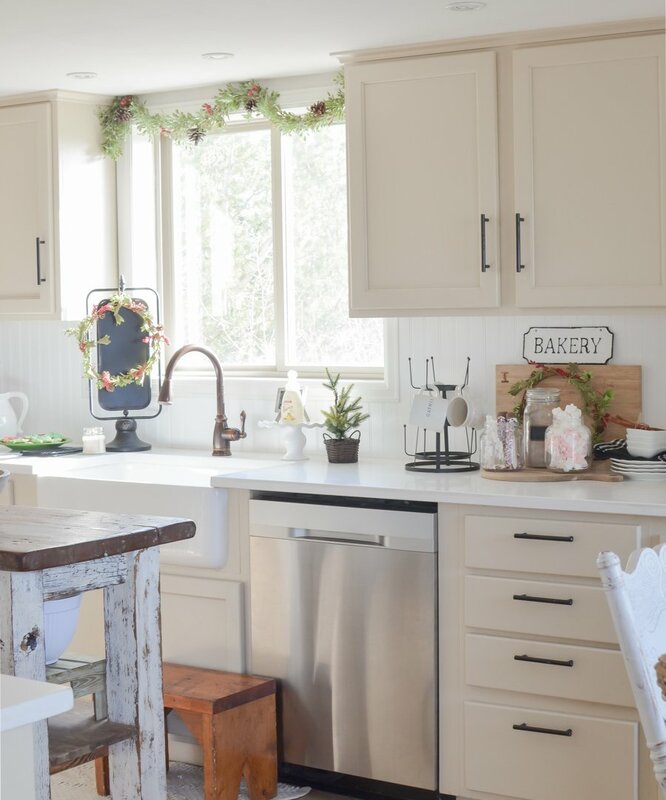 The simplicity of the kitchen makes it warm and inviting. That’s what a “home” is all about right!! 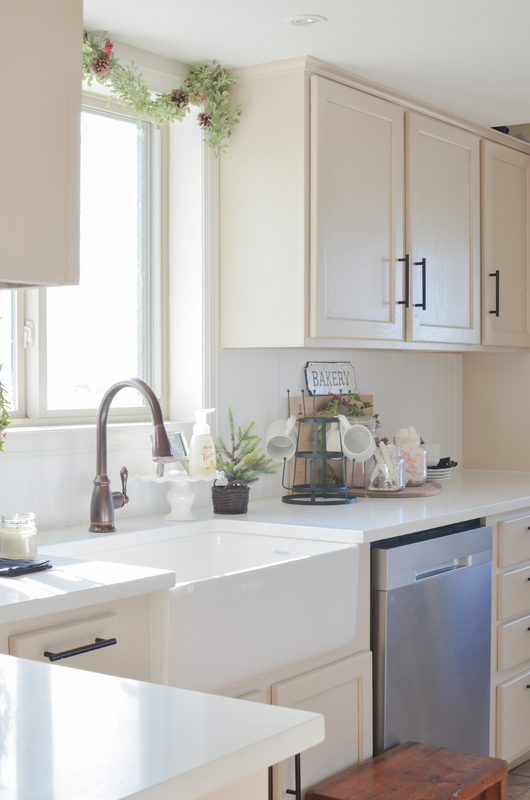 The heart of the home-kitchen- that says please join us for fellowship and love! BEAUTIFUL! So perfect. Love hearing about your family. Makes me also think of when my 50 ish kids were home. The very best of times! I agree Sally. It IS the best time!! Love the simple things. Especially at Christmas. We worry too much on what others think when we just need to remember the reason for the season and spending time with family and friends is the best Christmas there is! 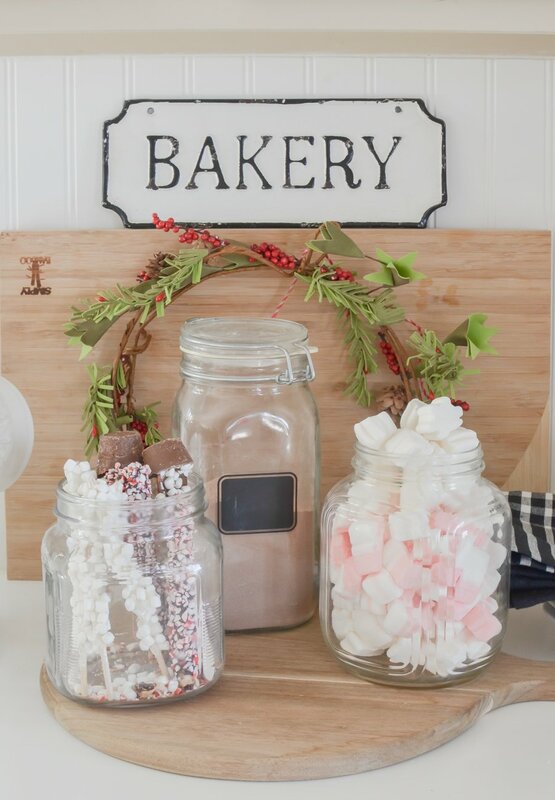 Love your hot chocolate display…your little girl is so sweet. I hope everyone is healthy now. This is such a fun idea! My kids would absolutely love this. 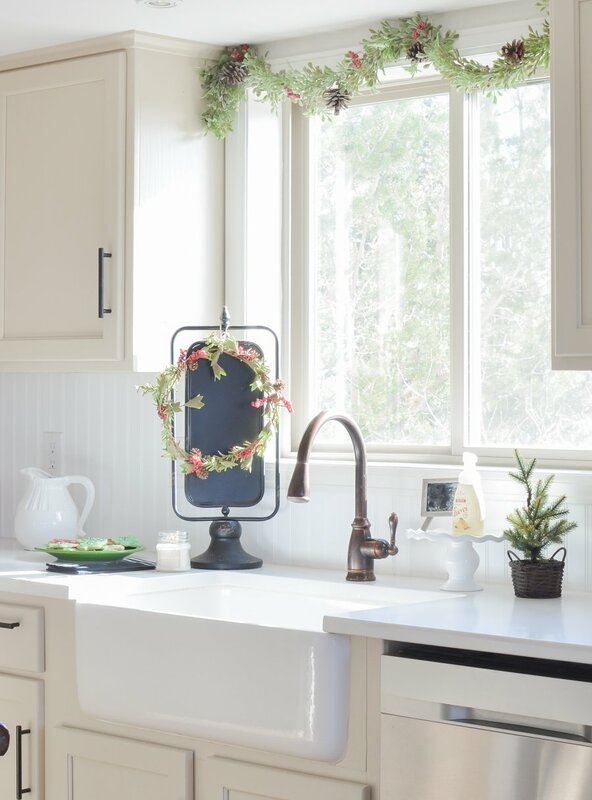 Loving the garland above the window. And how adorable is your daughter in that last picture?! ah thank you sweet friend! I just love that picture of your little one. I saw it when you posted it on Instagram. Reminds me of my daughter when she was that age. Happy Holidays to you and your sweet family, Sarah!! Your kitchen interior looking great. I am really impressed to see. I wanna decorate my kitchen like yours. What should I do then?